Pour blended mixture into flour mixture along with 3/4 c semisweet chocolate chips (i use ghiradelli semisweet chips) and mix them up. Bake at 350F for 12-15 mins, or until edges are browned. After the photo shoot we took Noodles for a walk down the road. (avoiding the strange man that was at the house talking to dad.) Then we went inside and made Jamie's tomato sauce and paired it with Barilla spaghetti. We tossed it together in my huge flower mixing bowl and we ventured outside with a lantern and sat at the top of the hill with a blanket and ate our spaghetti from the huge bowl. we had a night picnic with spaghetti! it was so much fun. the spaghetti was so flavorful and yummy tomatoey. Today I have the day off, and Mandy has a half day. I think I am going over there to take some pictures later on. 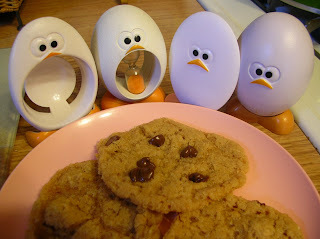 For now, it is cold and my tummy feels unwell from too many cookies before bedtime. I am bored...here is the vegan's 100 list....I bolded the items i have eaten....and put an 'x' next to the things i would never consider. 59. Scrapple 'x' why would a vegan eat scrapple? 89. Matzoh ball soup 'x' moth ball soup? I am going to make my own now, for you to fill out! so the day was filled with the music of "Highland Reign"....and i served one of the cute guitarists some sweet ol' shepherd's pah'. 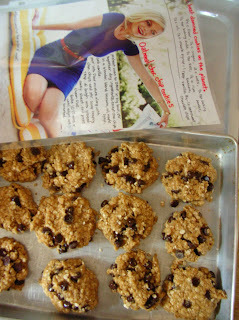 tomorrow adri is coming over to model for me and i am baking her the "best damned cookies on the planet"...oatmeal chocolate chip (from the garden of vegan...'maureen's oatmeal chocolate chip cookies') whoop. spent the night in bloomington last night. daunie came up to get me and we went shopping in nashville. i made her a plate of cheese & crackers, a pb smeared cracker, and some apple jacks for garnish. and a big daisy which she inserted in her hair. For dinner that night we had a big salad with 2 different dressings and some big crusty warm bread. then we went out and saw 'burn after reading' and daun & chris dined on popcorn and smelly garlic sticks. the end. next weekend is the renaissance faire! and there will be pictures of giant turkeys legs. got back from seeing 'vicky cristina barcelona'. i would give it 3.5 stars. i did enjoy it immensely. it definitely needed penelope cruz, it was a movie that started quickly then slowed. 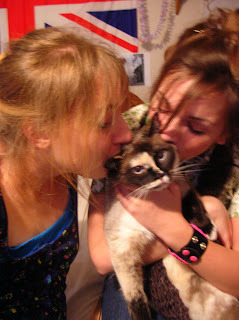 then penelope arrived. i now like javier bardem. i had only seen him before in 'before night falls' the johnny depp-as-a-woman-prostitute-movie. (but i did enjoy the rest.) so along with the food theme, i had a salad before i went. made some really delicious pasta today. i was craving it! and some tomatoes. so i just sauteed onions and garlic, and a pepper from the garden in some olive oil, added some mushrooms and mashed up fresh tomatoes from the garden. mixed it in my wheat rotini with some salty pasta water. really really gooooood. and watched mystic river. got the day off today from grading apples because of my back. 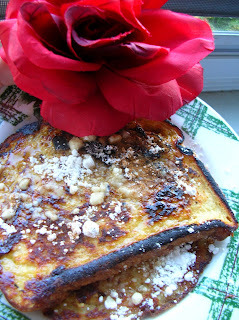 i had a delish fruit smoothie for breaky, then decided i wanted some vegan french toast from 'the farm' cookbook. so i am consuming that at this moment. it is so good. 1 c. soymilk/water, 2 tbsp. nutritional yeast flakes, 2 tbsp. flour, 2 tsp. sugar, 1/2 tsp. salt. dip slices of bread one at a time into the mixture until it soaks through but is not soggy. then fry the slices in margarine over medium heat until golden brown and crispy on both sides. serve hot with cinnamon and sugar or syrup. ordered vegan a go go this morning from amazon.com i can't wait until it comes in! i have checked 2 bookstores and they don't carry it. YAY more cute vegan cookbooks. food update....been doing detox/raw...makes me feel grrrreat..smoothies for breaky...lots of apples...pbjs on ezekiel and salads. but i do eat some wheat bread. squishy that i roll into balls. delish. 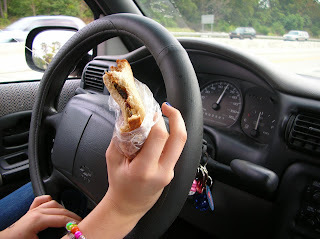 sunday we went irish festing and this picture is adree's pbj on the way home from the festivities. it was delish. here is a recipe for a good lavish pbj. Take two slices of aunt millie's hearth whole wheat bread (real fresh and squishy) and spread one slice with about 3/4 tbsp. chunky kroger natural peanut butter. then spread about 1-1/2 tbsp. blackberry preserves on top of peanut butter. Then close it up with the other slice of wheat bread. oh so delish on the road. party tomorrow night! 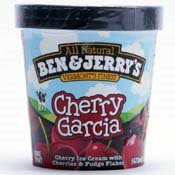 visited the store and bought goodies...sparkling red grape juice...soy vanilla ice cream, ben & jerry's cherry garcia ice cream ($1) for those people who just enjoy b&j's. and i enjoy buying it..i love the containers. my favorite b&j was Dublin Mudslide....and going to be having lovely dark chocolate truffles tomorrow night and a sticky toffee pudding. saw many signs at kroger that the party was coming....kirsten dunst on the cover of harper's bazaar...and "i want candy" playing on the radio. cheers. found a recipe last night for gingerbread in one of my grandpa's foxfire books. it is a really olde timey recipe, says it is over 100 years old. i don't know why, but i got the hankering for gingerbread. i don't even know if i have ever had a proper gingerbread before. i know i have had gingerbread cookies, they are dashing. 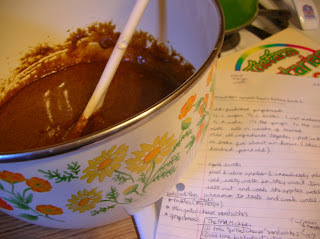 the gingerbread is in the oven right now....so i shall write again and with pictures when it is done! 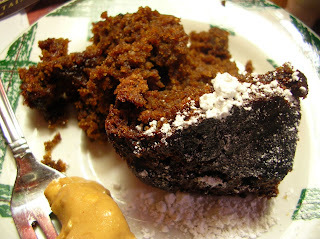 ~mmm the gingerbread is very moist and molasses sweet. i simply adore it. it doesn't need peanut butter, shown on my fork, but i just love it with everything! 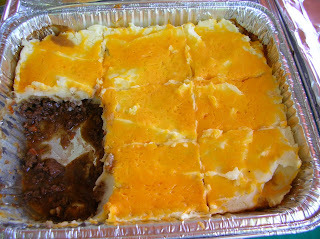 i am going to cut it into little squares and take it to work to share with all the carnivorous meat eaters. a taste of veganism! the moon is bright tonight and the coyotes are a-howling. tis an exciting night indeed. I really want to bake up a loaf of gingerbread cake. But it is late and I must awaken early from my slumber. I may bake one tomorrow night after workin's. I am finally going to get my zine printed off and distributed to friends and family. I am really excited about it, I have had it done since May! 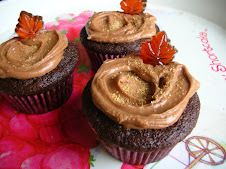 Some recipes I am not so sure about, I felt like i was rushing on them...like the honey graham cupcakes. But most all of the recipes are delish. Really simply because I cannot cook and use all those herbs and heating temperatures just confuse me. It is called CakeWalk if you happen upon it somewhere. adree and i made a cake today in a tart pan. 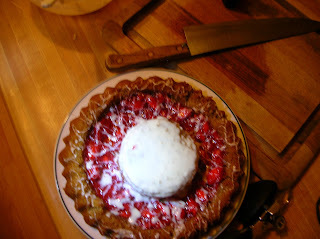 and drizzled it with frosting and put a ring of strawberry jam around it. the white thing in the middle is a miniature cake that is frosted. 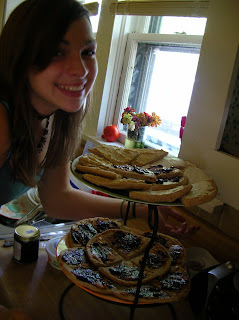 and we made vegan sloppy joes that were tasty on toast. 1-1/2 c flour, 1 c turbinado sugar, 1 tsp baking soda, 1/2 t salt, 1 c soymilk, 1/3 c oil, 2 t vanilla, 1/2 t white vinegar (i used 1 tsp and it had a faintly vinegar taste, so try it with 1/2 and see how it weeerks). preheat oven to 350f. mix dry in large bowl, add wet, vinegar last. combine. pour into greased cake pan(s) and bake 20-25 mins. cool and frost. "my blueberry nights" this evening. it wasn't all that bad. my favorite scenes were the beginning and the very end with the kiss. the leftover vanilla ice cream lips kiss. and jude law's british-ness. 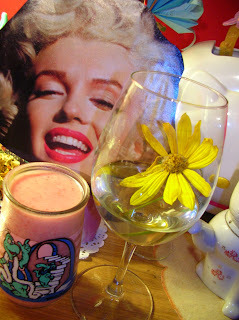 and i've been wanted to do a series of photographs with love & food....so it was inspiring. and i loved natalie portman...and rachel weisz strangely reminded me of marilyn monroe. had a smoothie tonight as well. will post a picture tomorrow along with recipe. the smoothie was a banana, pineapple, strawberry, ricemilk, strawberry soy yogurt smoovie. tomorrow is my outing with mom!! this picture is from the woods of tennessee. oh i miss it! we went on a long hike and i took pictures along the way. 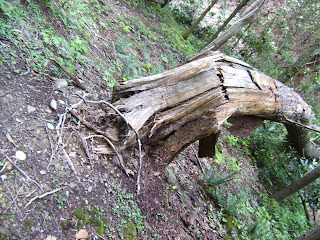 this is a broken tree. i love the dense moist woods. i want to live there by the stream where mermaids come up to sing and collect their smooth rocks they retrieve from under the currents. they stash them under bigger rocks next to the water. watched 'say anything' last night. and going to work pretty soon, i sort apples! this weekend mom and i are going to indy and shopping and eating. then we are stopping at kroger to get groceries for our -vegan- sticky toffee pudding we'll be making when we get home!!! Papaw's Birthday was on Saturday! I baked him a little vegan cake! It was a moist banana cake from www.veganvisitor.wordpress.com...Very good cake I may add, and so easy! 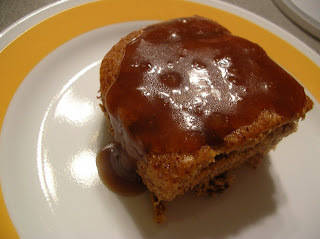 Then I paired it with a thick, sugary caramel sauce from www.theppk.com (isa!) It was delicious! Everyone loved it. Granny ate it with non-vegan vanilla ice cream...ha. i don't think she gets veganism. Definitely love love love the banana cake. The sauce was super rich and I halved the recipe because it was so darn sweet! 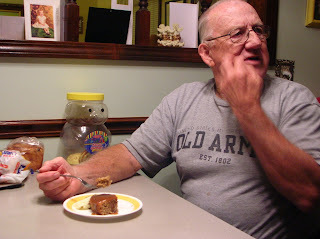 Here is a picture of the cake, and my Papaw! Also, I have the banana cake recipe, but rememeber it is from vegan visitor! My cake took about 30-35 mins. to cook in a small square glass pan. I omited the chocolate pieces, and did not toast my pecans. For my egg replacer, I mixed 2 TBS. flaxseed meal with 3 TBS. water in a cup. The cake looks like sticky toffee pudding! But doesn't taste like that wonderful Brit dessert! In a large mixer, cream the bananas with the oil, sugar and vanilla. Prepare the egg replacer as to the package directions and add it and the salt to the banana mixture. Once well combined, add the baking powder and soda, followed by the flour, adding it in batches. Stir in chocolate pieces and nuts, if using. Oil and dust a 8″ round pan with flour. Pour in the batter and bake on the centre rack for about 40 -45 minutes. Check bounce at the centre of the cake or insert and remove a toothpick. The cake is moist but it should come out fairly clean. 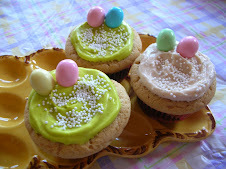 Allow to cool slightly and dust with confectioners sugar. This recipe will also make a great loaf (55 - 65 minutes), 12 muffins(18-20 minutes) or 24 mini muffins (about 13 - 15 minutes). have been craving chocolate chip cookies! 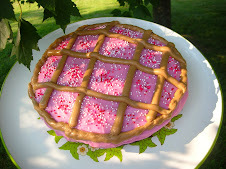 recipe from havecakewilltravel.com...go make them! they are little flat chewy cookies that are very tasty. a bit too sugary for me, but still yummy! my mum likes them without chocolate chips! i only put a few pecans, but would put more next time! preheat oven to 350F. line your cookie sheets with parchment paper or a Silpat. throw flour mix into wet ingredients, stir until well combined. divide into 6 equal portions, plop cookie dough onto cookie sheet. no need to flatten them, but leave at least an inch between the cookies as they will spread while baking. bake for 9 minutes, let cool on sheet. had a lovely day at ye olde orchard. sprayed theresa with the hose and almost made her fall. good gosh. picked up some free glazed apple cookies for mandy, taylor, and adree! And 2 caramel apples for mandy & taylor to share, and one for adree. can't wait until saturday, the hearntut festival with adree, mandy, and taylor too! I had a bit of endangered species chocolate today at work, sarah gave me 2 bars of dark chocolate. i ate about 4 or 5 pieces of the dark and then flew through that last tote of honey crisp apples. no matter, onto dinner! fixed up a lovely skillet of scrambled tofu (which i never thought i would like, it seemed that every vegan cookbook had a different recipe for scrambled tofu. but daunie and i made it topped with nutritional yeast sauce and it was magnificent) so i made that with tomatoes and asparagus, put it on a toasted english muffin and topped it with a spoonful of nutritional yeast sauce from la dolce vegan. Here is the "cheese" sauce recipe...great on wheat noodles as well! Whisk all ingredients in a small saucepan and heat over low heat until it begins to thicken, whisk and heat until desired thickness. Remove from heat and let it thicken even more. Then serve on noodles, or on a burrito, or on scrambled tofu...to make a sort of vegan eggs benedict. 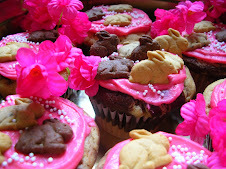 The lovely picture of these cupcakes comes from, well I don't remember who, but they are Babycakes cupcakes I do believe. Nevertheless, they are quite lovely and cute. Here is my recipe for vanilla frosting. It really is truly delectable and simple. Whip all the ingredients together and spread on cupcakes. If too runny, add more sugar of course! Also, for the tinted frostings, I have heard around town of various things you can use. For yellow, use stale turmeric, a tiny tiny bit! For pink, use POM juice or pureed raspberries, for the mint green color, use parsley juice (put parsley through a juicer i suppose). There ya have it. 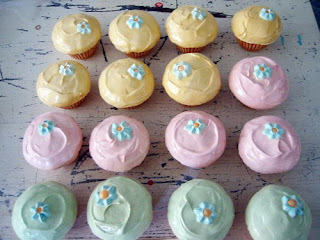 Whip up some cupcakes and this frosting and then throw them at party guests and knock their socks off. this is a statment! i am going to officially post more recipes. 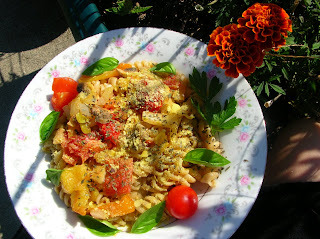 what are you poor visitors doing at my blog anyway, with the number of recipes i post? there are really absolutely none! I must post some extra special ones to get you to keep coming back. like my title quote says, "throw lovely food at them!" and you have no lovely food to throw! or witty conversation to go along with it....so let me just go skuddle in there and pick up a nice recipe for you. i will be back with a post! I am waiting for Mother to get home so I can eat some dinner. I am really craving more bbq seitan, but i don't feel like making it. So I'm going to just heat up a new Amy's burrito that I've never tried. Daunie said it is her favorite, it is the breakfast burrito made with tofu. I am going to eat it with hummus and my favorite salsa ever, Newman's tequila lime (so hard to find! I have to go to Indy to get it).....bon appetit! another lovely pic from daunies brunch clothing swap party..a little pic of adree next to the pita smeared with tofutti cream cheese, hummus, cucumber, and pbj pitas! 2. What are the top 3 dishes/recipes you are planning to cook? 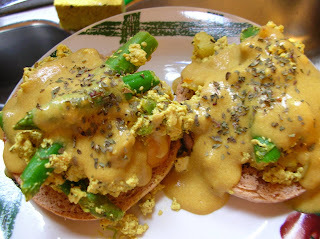 I am planning to cook scrambled tofu again, topped with nutritional yeast gravy on a toasted English muffin very fuhncy). Also, homemade ketchup from How It all Vegan!, and more of my good bbq seitan, which I am craving. I top it with curry ketchup on a piece of hot toast. 3. Topping of choice for popcorn? I don't like poppincorn! 4. Most disastrous recipe/meal failure? Hmmmm....the only one I can think of is when Adree was making homemade olive oil butter, and it called for 1/4 c. olive and oil and 1/4 tsp. salt, we both read it as 1/4 cup of each, so it was terribly salty and hilarious. 5. Favorite pickled item? Pickled banana peppers! I use to make the boys at Subway put handfuls on my veggie sub. 6. How do you organize your recipes? I took apart my 3" english binder and morphed it into a giant recipe book. 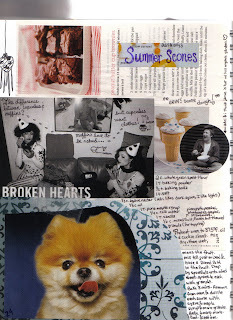 I write my recipes on magazine pages and then slip them in little page protectors in my binder! very homemade and pretty. 7. Compost, trash, or garbage disposal? I like compost but we don't have one. That is an odd little question. 9. Fondest food memory from your childhood? I used to eat chili with my Mamaw, and she would slice raw onions and eat them with her chili. And her blackberry cobbler was divine, and her pumpkin pie. I also used to eat Frosted Flakes & Fruit Loops mixed...that is probably the fondest. I never helped bake as a child. 10. Favorite vegan ice cream? Homemade carob ice bean from the farm cookbook. 11. Most loved kitchen appliance? my food processor! i have used it so many times! 12. Spice/herb you would die without? dried basil!!!!!!!!!!!!! 14. Favorite flavor of jam/jelly? Blackberry jam!!! and black raspberry...oh so sweet and delish. 15. Favorite vegan recipe to serve to an omni friend? Hmmm...I love to give them oatmeal chocolate chip cookies from the garden of vegan, they are the best cookies i have ever had! 16. Seitan, tofu, or tempeh? i love tofu the best, i like it raw and extra firm! but seitan is amazing with bbq and boiled in stock to taste like chicken. i don't really fancy tempeh. 18. What is sitting on top of your refrigerator? some ky bbq chips(moms) and a glass cake container...and jars of metal cookie cutters. 24. Favorite vegan candy/chocolate? endangered species chocolate bars. 25. Most extravagant food item purchased lately? OOH! I love love! purchasing new extravagant foods when you have a little extra greens! I purchased figs a couple weeks ago and felt naughty. 27. What is one recipe or ingredient or cooking technique that you’ve become familiar with in the last year that you can’t imagine you ever lived without? I can't see myself not making this luscious soft oatmeal bread, b/c i absolutely love bread...but probably vegan mac and cheese. I missed mac and cheese so much and now I have the best vegan cheese sauce to go on wheat rotini. 28. What are your plans for Thanksgiving? making another pumpkin pie, we cook at home and my sister and i make vegan food...and we will probably make bbq seitan this year and have a big salad. 29.What is one really weird food that you enjoy, and probably no one else does? I was just eating a bbq seitan sandwich last night, and i ate a piece of it without any seitan on it, just bbq sauce on cold toast, and it was so good. So mine is bbq sauce on cold toast. Repost with your answers and make up a new question! Another food survey! I just love these...take a gander..
Cake:: carrot cake from monon coffee company. Cookie:: oatmeal chocolate chip from the garden of vegan. adri's lemon cookies are also very luscious, but so dainty that they should be eaten with tea or at a special party! Pie:: pumpkin! (wolffie's from la dolce vegan)...the tastiest vegan pumpkin pie i have had. before, i loved chris' grandmas pump pie. 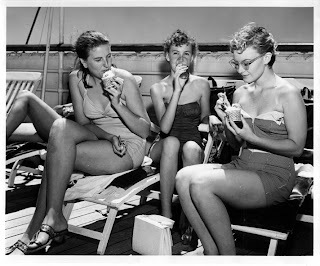 Ice Cream:: homemade carob ice bean-recipe from The farm, a commune in TN. Pudding:: chocolate! i am hooked on it right now. i just made some carob pudding with pb and banana. tasty too, but adree and i's pudding we made while watching jamie at home was good! Muffin:: soma's buckwheat blueberry, although i haven't tasted one in so long. Other Desserts:: i consider pbj's a dessert. Granola bar:: um...i don't really eat them. but i like larabars sometimes. Candy bar:: The only candy bar i eat is endangered species dark chocolate...72%, with the chimp on the front! Chocolate candy:: endangered species! i also love the mint bar, with the rainforest scene on the package. Bean:: pinto beans, edamame beans! Italian:: wheat spaghetti with homemade marinara is divine..
Pizza Topping:: at bazbeaux i love to get mushrooms, basil, green olives, and extra sauce. Salad and salad dressing:: i like a dark leaf lettuce salad with little tibet's ginger dressing! Breakfast cereal:: b-foods maple flakes and kashi 7 whole grain flakes, my absolute favorite is barbara's bakery organic grain shop cereal. Hot cereal:: oatmeal with maple syrup and cinnamon, really stiff, not much liquid. Chips:: organic yellow corn tortilla chips!!! gaah! Crackers:: late july brand classic 'buttery' crackers...mmmmm new fave. Potato:: little red potatoes with the skins! Thing to put on toast:: blackberry jam from appleworks! !